There were 4 of us women on vacation in Hawaii – we played this every night. It doesn’t matter if you win or lose, it’s a lot of fun and never gets old. One game you’ll be on fire – seeing all the matches and the next game you can’t seem to find any. We laughed so much. Every different version of the game was fun, we let the dealer pick so we played 3 of the 4 versions many, many times. 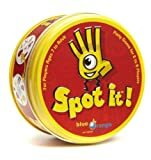 This is a great fun game for any age, mixed ages, competitive types as well as more passive types. I can’t wait until the next time I play it again!